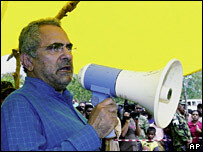 The Cabinet of East Timor's new Prime Minister Jose Ramos-Horta has been sworn in at a ceremony in Dili. The event marks further progress towards a return to order for the country, which was hit by serious street violence and unrest. Factional fighting erupted three months ago, leaving at least 21 people dead and thousands displaced. President Xanana Gusmao said the swearing in "closed a cycle of profound crisis" that had threatened the nation. "We must now make enormous efforts to bring reconciliation among the East Timorese and to heal the wounds that divide them," he told ministers. The crisis was sparked by the sacking in March of 600 soldiers. This led to ethnic and gang violence which causes tens of thousands of people to flee their homes. 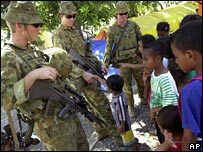 It prompted a call by East Timor's government for international peacekeepers to help restore order. Former Prime Minister Mari Alkatiri, widely blamed for sparking the violence by sacking the troops, resigned last month. The ceremony took place at the presidential palace and was overseen by 40 of the 2,200 Australian-led troops who have been keeping the peace in this volatile country. Mr Ramos-Horta, who was appointed prime minister on Saturday, said the immediate task of the government was to consolidate security. "Our people have suffered greatly, and many who were poor before the crisis have now lost the little that they had," he said. "This government is not going to find excuses for inertia." The 15-strong cabinet includes nine members who served under the previous government. East Timor's ambassador to the UN, Jose Luis Guterres, has been named foreign minister, while Mr Ramos-Horta will also hold the post of defence minister. Jose Teixeira was appointed minister of natural resources, with responsibility for the country's extensive gas reserves. The new Cabinet is expected to hold its first meeting later in the day.